Excellent reproduction of the 727 automatic transmission throttle control lever used to provide proper kickdown linkage geometry for high performance applications. Used on 1966-70 4-barrel & 6 Pack big blocks in A, B, & E-Body cars, 1968-73 340 A-Body cars, 1970-71 340 4-barrel E-Bodies, and all 426 Hemi cars. Formed from the correct gauge steel then zinc phosphate & oiled for original appearance. Includes proper 1/4-20 indented hex head bolt, lock washer and square nut. For use with 3-piece kickdown linkage applications only. Reference Chrysler part number 2536 270. Excellent reproduction of the 727 automatic transmission gearshift control lever used on 1967-75 A, B & E-Body applications. Formed from the correct gauge steel then zinc phosphate & oiled for original appearance. Includes proper 1/4-20 indented hex head bolt, lock washer and square nut. Reference Chrysler part number 2801 828. An excellent reproduction of the torque converter drain cover used on 1962-78 big block 727 automatic transmission applications. This emboss pattern was used until 4/10/1972 and the part number was changed to 3515 920. Formed from the correct gauge galvanized steel sheet with all of the details of the original part. Includes four correct hex coni SEMS mounting screws. Reference Chrysler part #1942 248. Excellent reproduction of the automatic transmission kick-down linkage bell crank pivot stud used on 1965-70 A, B & E-Body applications. Also can be used on 1971-76 A-Body small block applications. Used as the throttle rod pivot on Max Wedge and Hemi cross ram applications too. Machined with all of the details of an original part and clear zinc plated for proper appearance. Includes proper flat washer and correct retaining pin. Reference Chrysler part numbers 2658 286, 6027 983, and 120 394. 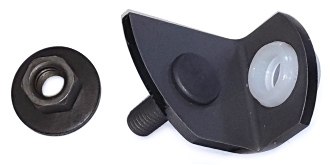 Exact replacements of the hairpin and flat washer used on throttle cable bracket pivot pins to secure the automatic transmission kick-down linkage bell crank on most 1966-71 applications. Also used on the pivot pin located on automatic transmissions from 1965-76. Hairpin is zinc phosphate coated and the washer is provided in clear zinc finish as original. Reference Chrysler part numbers 120 394 and 6027 983. 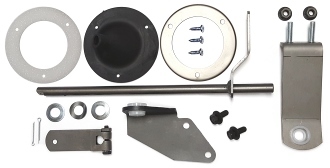 Excellent reproductions of the gearshift control shaft boot, mounting flange, and gasket used on console shifted 1967-73 A-Body, 1967-69 B-Body, and 1967-69 C-Body cars with automatic transmission. The assembly includes an injection molded torque shaft boot, an open cell foam gasket, and a formed steel mounting flange. Three #10 x 5/8” PHP mounting screws are included. Replace that ripped boot and rusty mounting flange today! Reference Chrysler part number 2781 407. An excellent reproduction of the gearshift control assembly used on console shifted 1967-73 A-Body cars with automatic transmission. 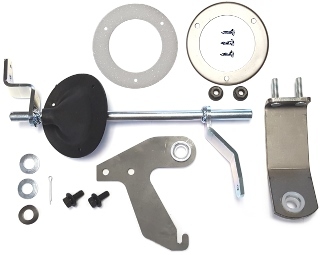 The assembly includes the gearshift control torque shaft, the upper support bracket & bushing, the lower support bracket & bushing, the gearshift control lever, the torque shaft boot with open cell gasket & formed mounting flange, flat & wave washers, cotter pins and correct mounting hardware. Appropriate parts are zinc phosphate and oiled for original appearance. An excellent reproduction of the gearshift control assembly used on console shifted 1967-69 B-Body cars with automatic transmission. 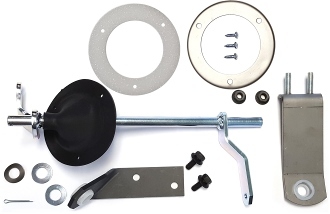 The assembly includes the gearshift control torque shaft, the upper support bracket & bushing, the lower support bracket & bushing, the gearshift control lever, the torque shaft boot with open cell gasket & formed mounting flange, flat & wave washers, cotter pins and correct mounting hardware. Appropriate parts are zinc phosphate and oiled for original appearance. An excellent reproduction of the gearshift control assembly used on console shifted 1970 B-Body cars with automatic transmission. 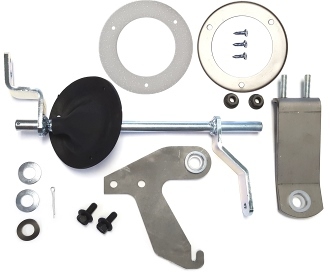 The assembly includes the gearshift control torque shaft weldment, the upper support bracket & bushing, the lower support bracket & bushing, the torque shaft boot with open cell gasket & formed mounting flange, flat & wave washers, a cotter pin and correct mounting hardware. Upper bracket is zinc phosphate and oiled as original. Torque shaft weldment is clear zinc plated as original. An excellent reproduction of the gearshift control assembly used on console shifted 1970 E-Body cars with automatic transmission. The assembly includes the gearshift control torque shaft weldment, the upper support bracket & bushing, the lower support bracket & bushing, the torque shaft boot with open cell gasket & formed mounting flange, flat & wave washers, a cotter pin and correct mounting hardware. Upper bracket is zinc phosphate and oiled as original. Torque shaft weldment is clear zinc plated as original. An excellent reproduction of the gearshift control assembly used on console shifted 1971-74 B & E-Body cars with automatic transmission. If your car is equipped with a T-Handle shifter, this is the kit you need. The assembly includes the gearshift control torque shaft weldment, the upper support bracket & bushing, the lower support bracket & bushing, the torque shaft boot with open cell gasket & formed mounting flange, flat & wave washers, a cotter pin and correct mounting hardware. Upper bracket is zinc phosphate and oiled as original. Torque shaft weldment is clear zinc plated as original. An excellent reproduction of the torque shaft assembly used on column shifted 1967-73 A-Body cars with 727 automatic transmission. Also used on ALL 1970 A-Body 727 automatic transmission equipped cars whether console or column shifted for the ignition safety lock-out linkage. The assembly includes the left frame rail support bracket, the torque shaft that connects linkage from the steering column to the transmission, and the transmission support bracket. All parts are zinc phosphate and oiled for original appearance. 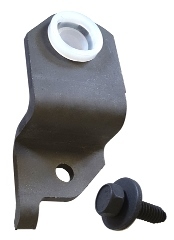 Assembly includes correct nylon bushings, mounting hardware, flat washer, and retaining clip. Reference Chrysler part numbers 2467 932, 2800 939, and 2800 942. An excellent reproduction of the torque shaft assembly used on column shifted 1966-70 B-Body cars with 727 automatic transmission. Also used on ALL 1970 B-Body 727 automatic transmission equipped cars whether console or column shifted for the ignition safety lock-out linkage. The assembly includes the left frame rail support bracket, the torque shaft that connects linkage from the steering column to the transmission, and the transmission support bracket. All parts are zinc phosphate and oiled for original appearance. 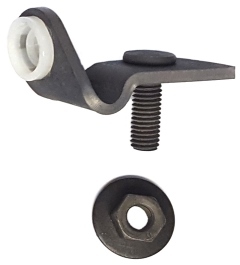 Assembly includes correct nylon bushings, mounting hardware, flat washer, and retaining clip. Reference Chrysler part numbers 2534 423, 2534 407, and 2534 513. An excellent reproduction of the torque shaft assembly used on column shifted 1970-74 E-Body and 1971-72 B-Body cars with 727 automatic transmission. Also used on ALL 1970 E-Body cars with 727 transmission equipped cars whether console or column shifted for the ignition safety lock-out linkage. The assembly includes the left frame rail support bracket, the torque shaft that connects linkage from the steering column to the transmission, and the transmission support bracket. All parts are zinc phosphate and oiled for original appearance. 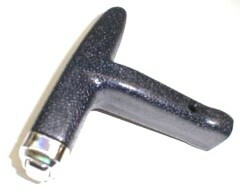 Assembly includes correct nylon bushings, mounting hardware, flat washer, and retaining clip. Reference Chrysler part numbers 2950 920, 3467 608, and 2950 910. An excellent reproduction of the gearshift control torque shaft frame bracket used on column shifted 1966-71 A-Body cars with automatic transmission. Also used on ALL 1970 A-Body cars with automatic transmission whether console or column shifted for the ignition key safety lock-out mechanism. The bracket bolts to the left frame rail and supports the torque shaft that connects linkage from the steering column to the transmission. Formed from heavy gauge steel and zinc phosphate and oiled for original appearance. 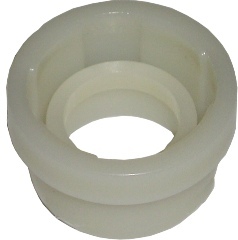 Includes correct nylon bushing and 5/16-18 mounting screw. Reference Chrysler part number 2467 932. An excellent reproduction of the gearshift control torque shaft frame bracket used on column shifted 1966-69 B-Body cars with automatic transmission. Also used on ALL 1970 B-Body cars with automatic transmission whether console or column shifted for the ignition key safety lock-out mechanism. 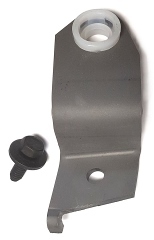 The bracket bolts to the left frame rail and supports the torque shaft that connects linkage from the steering column to the transmission. Formed from heavy gauge steel and zinc phosphate and oiled for original appearance. Includes correct nylon bushing and 5/16-18 mounting screw. Reference Chrysler part number 2534 423. An excellent reproduction of the gearshift control torque shaft frame bracket used on column shifted E-Body and 1971-72 B-Body cars with automatic transmission. Also used on ALL 1970 E-Body cars with automatic transmission whether console or column shifted for the ignition key safety lock-out mechanism. 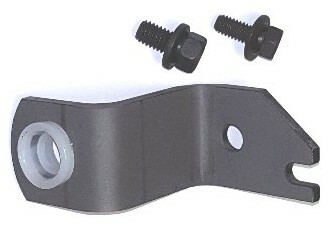 The bracket bolts to the left frame rail and supports the torque shaft that connects linkage from the steering column to the transmission. Formed from heavy gauge steel and zinc phosphate and oiled for original appearance. 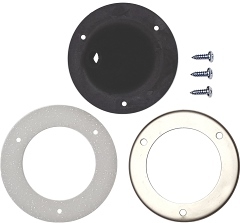 Includes correct nylon bushing and 5/16-18 mounting screw. Reference Chrysler part number 2950920. An excellent reproduction of the gearshift control torque shaft transmission bracket used on 1968-74 A-Body column shifted cars with 727 automatic transmission. Also used on ALL 1970 A-Body 727 automatic transmission equipped cars whether console or column shifted for the ignition safety lock-out linkage. The bracket mounts to the left side of the transmission and supports the torque shaft that connects linkage from the steering column to the transmission. Formed from heavy gauge steel and zinc phosphate and oiled for original appearance. Includes correct nylon bushing and 7/16-14 hex coni sems mounting nut. Reference Chrysler part number 2800 942. An excellent reproduction of the gearshift control torque shaft transmission bracket used on 1966-70 B-Body column shifted cars with 727 automatic transmission. Also used on ALL 1970 B-Body 727 automatic transmission equipped cars whether console or column shifted for the ignition safety lock-out linkage. The bracket mounts to the left side of the transmission and supports the torque shaft that connects linkage from the steering column to the transmission. Formed from heavy gauge steel and zinc phosphate and oiled for original appearance. Includes correct nylon bushing and 7/16-14 hex coni sems mounting nut. Reference Chrysler part number 2534 513. An excellent reproduction of the gearshift control torque shaft transmission bracket used on column shifted E-Body and 1971-74 B-Body cars with 727 automatic transmission. Also used on ALL 1970 E-Body cars with 727 automatic transmission whether console or column shifted for the ignition key safety lock-out mechanism. 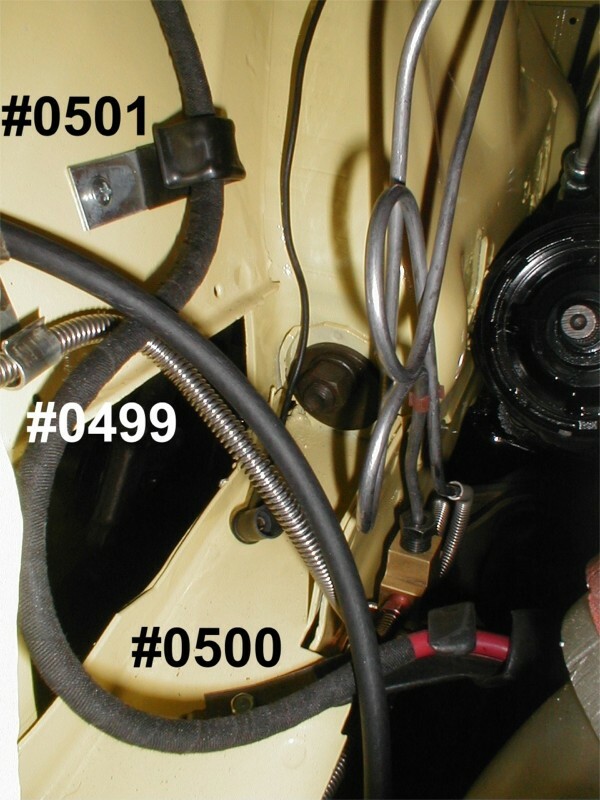 The bracket bolts to the left side of the transmission and supports the torque shaft that connects linkage from the steering column to the transmission. Formed from heavy gauge steel and zinc phosphate and oiled for original appearance. Includes correct nylon bushing and both a 5/16-18 and 3/8-16 mounting screw depending upon application. Reference Chrysler part number 2950 910 and 3575 327. Faithfully reproduced to be better than the original, yet exacting in every detail! Includes hard to find mounting screw and installation instructions. Used on all 1971-74 B & E-Body console shifted automatic transmission equipped cars. Reference Chrysler part number 3467 760. 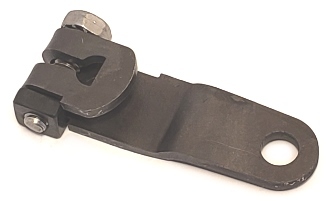 Wire retaining clip for the reverse light switch wire on 3 and 4-speed transmissions. Mounts under side cover retaining bolts at top rear and upper rear side locations. Zinc plated correct gauge steel and thermo-plastic coated for proper appearance. 2 clips required per transmission. Excellent reproduction of the wiring clip found on the upper left bell housing-to-engine block attaching bolt for both manual and automatic transmission equipped cars. Used to route the reverse light/neutral safety wiring harness from the firewall bulk head to the transmission switch. Also found in conjunction with part #AX41T on 4-speed side covers. Formed from correct gauge steel, zinc plated, and thermoplastic coated for original appearance. Reference Chrysler part number 6015 236. Excellent reproduction of the wiring clip found on either of the upper automatic transmission tail shaft attaching bolt. Used to route the reverse light/neutral safety wiring harness from the firewall bulk head to the transmission switch. Once in place, the clip is bent forward to rest on the transmission housing. Formed from correct gauge steel, zinc plated, and thermoplastic coated for original appearance. Reference Chrysler part number 6015 707. Used on 1967-69 A, B, C-Body applications with automatic transmission and floor mounted shifter. The bracket is formed from the correct gauge steel and zinc phosphate & oiled like original. Includes zinc phosphate coated 1/4-20UNC Grade 5 bolt and square nut, and clear zinc plated external tooth lock washer. Secures to top of torque shaft and connects to the shifter mechanism. Reference Chrysler part number 2781 416. Used on 1967-74 A, B, C, and E-Body applications with automatic transmission. Two bushings required for both column and floor shifted automatic transmission equipped cars. Also, two bushings required for 1970 4-speed reverse lockout linkage. Reference Chrysler part number 2660 401. Used on 1966-74 A and C-Body, 1966-70 B-Body, and 1970 E-Body applications with automatic transmission and floor shift. Reference Chrysler part number 2660 401. Comes complete with correct coni keps nuts and correct style bushing. Mounts to automatic transmission housing and is necessary for all floor mounted shifter applications. Used on 1971-74 B & E-Body applications with automatic transmission and T-Handle floor shift. Comes complete with correct coni keps nuts and correct style bushing. Mounts to automatic transmission housing and is necessary for all floor mounted T-Handle shifter applications. 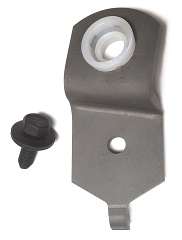 This bracket holds the speedometer cable and brake line to the left inner fender well on 1966-1970 B-Body cars. Made from the correct gauge steel and clear zinc plated as original. Comes with correct mounting screw. Click here to view photograph for proper location.